© 2015 LiftMaster All Rights Reserved *Not compatible with garage door openers manufactured by Marantec or Hormann Why carry multiple brands when all you need is one? 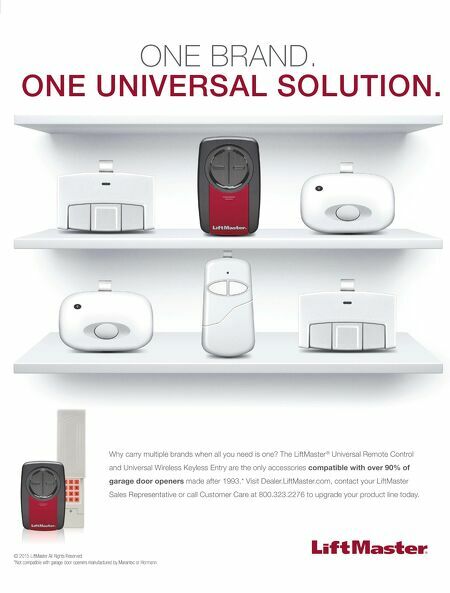 The LiftMaster ® Universal Remote Control and Universal Wireless Keyless Entry are the only accessories compatible with over 90% of garage door openers made after 1993. * Visit Dealer.LiftMaster.com, contact your LiftMaster Sales Representative or call Customer Care at 800.323.2276 to upgrade your product line today. ONE BRAND. ONE UNIVERSAL SOLUTION.